New England pounds Saints with better defense, strong offense. NEW ORLEANS — If Tom Brady and the Patriots were suffering from a Super Bowl hangover, it looks as though a trip to New Orleans pulled the defending champions out of it. The 40-year-old Brady hasn’t often looked better in his long, illustrious career, providing an audible contingent of traveling Patriots fans who chanted their star QB’s name ample reason to spend the rest of their Sunday celebrating on Bourdon Street. Bouncing back with a vengeance from a season-opening loss, Brady threw three touchdown passes in the first quarter for the first time in his career, eclipsed 300 yards passing in the first half for only the second time, and New England scored 30 first-half points en route to a 36-20 victory over the winless Saints. Brady’s maiden Super Bowl triumph in the Superdome back in February 2002 is bound to be one of his fondest memories, but the 18-year veteran looked like a superior QB in his latest visit. He finished 30 of 39 for 447 yards without an interception – at least not one that counted. Saints defenders caught Brady’s passes twice, but both plays were wiped out by New Orleans penalties. Brady joined Warren Moon as the only QBs age 40 or older in NFL history to pass for at least 400 yards and 3 TDs in a game, according to the Elias Sports Bureau. 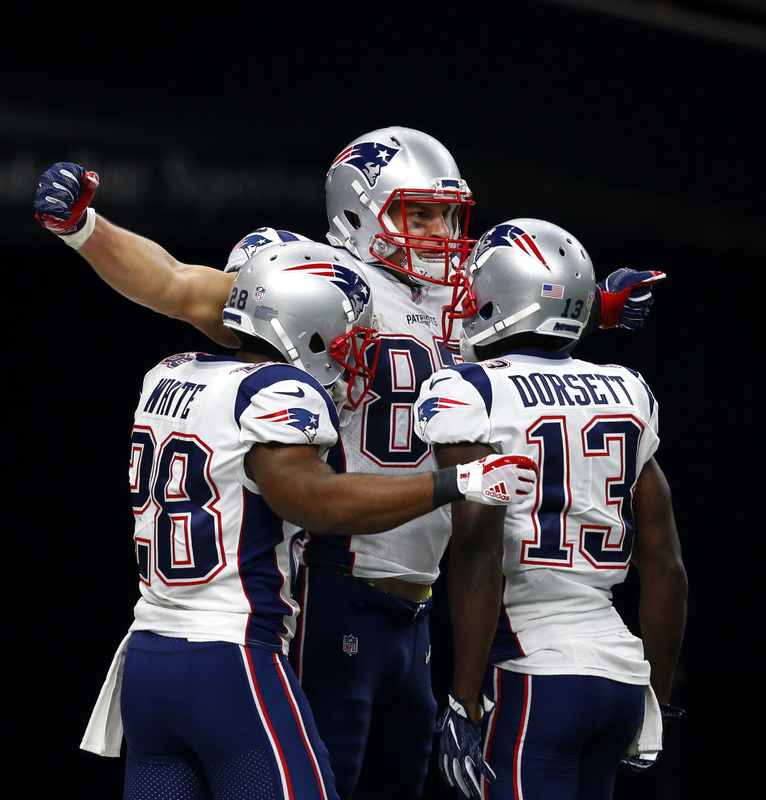 Rob Gronkowski had a 53-yard catch and run to highlight his six-catch, 116-yard performance, but left the game in the second half with a groin injury. In Brady and the Saints’ Drew Brees, the game featured the NFL’s top wo active quarterbacks in terms of career yards and touchdowns. Their 922 TD passes and 128,251 yards passing combined coming in represented the most by starting QBs in the same NFL game. He was 27 of 45 for 356 yards and two TDs. The Saints’ desperation to stay close was encapsulated by a failed attempt to convert a fourth down – despite being well within field goal range on the Patriots 25-yard line – with 2:27 left in the first half and New England up by 13. Brady responded by marching New England to the Saints 10 to set up Stephen Gostkowski’s field goal, making it 30-13 at halftime. Patriots: In addition to Gronkowski’s groin injury, Burkhead had a rib injury in the second half. DB Eric Rowe was treated for a groin injury. Saints: Rookie CB Marshon Lattimore left the game to be evaluated for a concussion. DE Trey Hendrickson left the game late in the first quarter with what the club described as a leg injury. Defensive end Mitch Loewen needed help off the field after injuring his left leg in the fourth quarter. New England returns home to face the Houston Texans. The Saints open NFC South divisional play at Carolina.